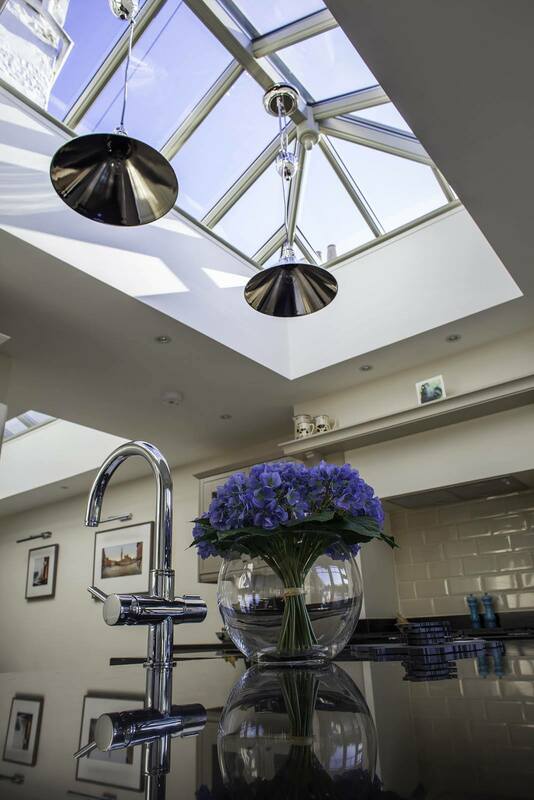 We’ve been very pleased with the service from Timber Windows Channel Islands and the fitting team, whilst also appreciating the quality of the lanterns, windows and doors – they really are in a different league. Timber Windows Channel Islands is based on Guernsey, also serving the island of Jersey too, and has a stunning showroom, showcasing a broad range of products and inspiration. The look desired by the Loveridge’s was drawn up by Timber Windows to illustrate the precise dimensions and ensure everything was covered to the smallest detail, and comprised of French doors, flush casement windows, a single entrance door and two roof lanterns. 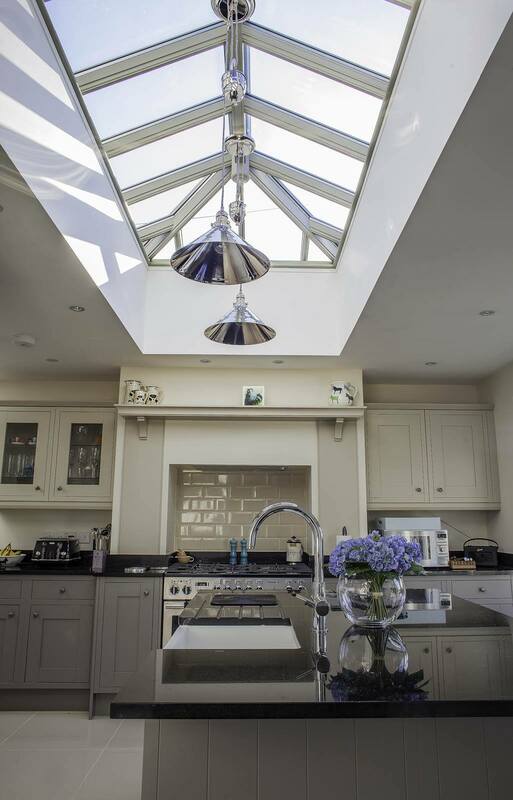 All were specified in a calm, contemporary shade of French Grey to work seamlessly alongside the new kitchen design scheme, with the flush casement windows acting as partial sidelights to the French Doors. The fine 18mm astragal bar formation lines perfectly through the doors, windows and the accompanying single door, complemented by the smart chrome fixtures both inside and out. 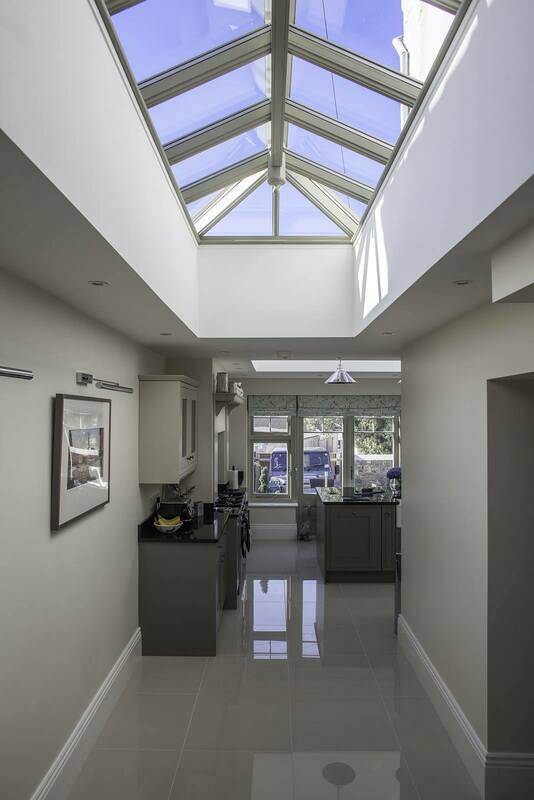 The pair of roof lanterns provides a flood of light from above to both the kitchen and hallway, creating a beautiful, airy space throughout.